Now there’s a better way to clean your floors with the Hurricane 360 Spin Mop. It is a lightweight mop that can drastically cut down your cleaning time. Best of all you won’t have to touch a dirty mop again. The Hurricane Spin Mop features a 360 swivel head is made with microfiber that can lift up and grab onto dirt, dust, and hairs. Plus when you mop it cleans, dries and polishes all at once. Unique to the Hurricane Spin Mop is the patented Bucket with Centrifugal Dryer Technology. This technology lets you easily and quickly rinse and dry your mop without ever having to touch it. First you just add water and cleaning solution to the bucket, dip in the Hurricane Mop, and then start cleaning. When the the mop gets too dirty just dip it back into the water and the microfiber fingers of the mop will open up. This releases all the dirt and hair into the bucket. Next place the Hurricane Mop inside the dryer area and step on the foot pedal. The centrifugal force will spin the mop at over 1,000 RPMs to quickly rinse and dry the mop for you. Now it is ready to clean again and you can just repeat as needed. The mop head is also machine washable, up to as many as 300 times. So when you are done cleaning you can detach it from the mop handle, throw in the washer, and use it over and over again. You can use the Hurricane Spin Mop to clean on almost any surface, including ceramic tiles, laminate, marble, hardwood, and more. Plus the 360 degree swiveling head lets you to clean corners and the sides of the baseboards. In addition, the light alloy mop handle can also lie flat for cleaning under furniture. 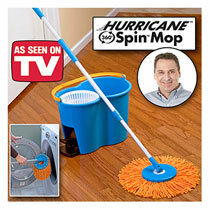 The Hurricane Spin Mop sells for 2 payments of $19.99 plus the cost of shipping and handling. Or you can just make a single payment of $39.98 plus shipping all at once.